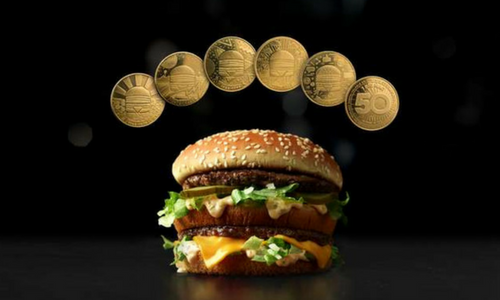 Celebrating the 50th anniversary of the signature Big Mac, McDonald’s announced it will debut new limited-edition global food currency – “MacCoin” which customers can use in 50 different countries to redeem a free Big Mac, starting on 2 August. McDonald’s stated that 6.2 million MacCoins will be available in more than 50 countries around the world. Starting at lunchtime on Thursday, customers who purchase a Big Mac will receive a free MacCoin. Customer then can redeem a free Big Mac using the MacCoin at any participating location in the world. The day is selected as the release date for the coins as it would have been the 100th birthday of Jim Delligatti, a McDonald’s franchisee in western Pennsylvania who invented the Big Mac. The brass-coloured MacCoins will feature 5 unique designs, each representing a decade of the signature burger and touchstones from that era. The first coin is decorated with flowers to represent the period of “flower power” in the 1970s when it was first invented. The second one alludes to pop art in the 1980s, and the third one has “bold, abstract” shapes like a pair of Mario Lopez’s favorite A.C. Slater pants from the 1990s. The forth coin shows off the technological boom in 2000s while the last one portrays the evolution of communication. The chain said the inspiration to create these coins came from the “Big Mac Index”, which The Economist created in 1986 to measure the purchasing power of international currencies every year. “They use it to this day, why not have some fun with it? Create our own currency.” Steve Easterbrook, McDonald’s CEO, told USA Today. The launch of MacCoin comes after the chain announced it will give away a free order of fries every Friday to customers who use its mobile app and spend more than $1 on their order. The chain has been ramping up free food promotion for customers, and banking on mobile ordering and other tech-focused features to attract millennial consumers, as US sales have cooled down. The revenue dropped 12% and sales at US stores grew at a slower pace than expected. The campaign is called the Public Transport Workers' Appreciation Campaign and runs on platforms such as OOH and online. ..
Esquire partners with Wardrobe, Lustro and Kronenbourg 1664 with its returning 'Best Dressed Real Man' competition. .. Global – As part of the Louis Vuitton's Core Values global campaign, the fashion brand has roped in world heavyweight champion Muh..
After former HK Express Andrew Cowen was replaced after the cancellation of 18 flights over a peak holiday period, the airline has..